Burmeister, H. 1838. Handbuch der Entomologie. Kaukerfe. Gymnognatha. 2(2), 756 pp. Theodor Christian Friedrich Enslin (Berlin). BHL Reference page. Agudelo, A.A, & Rivera, J. 2015. Some taxonomic and nomenclatural changes in American Mantodea (Insecta, Dictyoptera)—Part I. Zootaxa 3936(3): 335–356. doi: 10.11646/zootaxa.3936.3.2 Reference page. Ehrmann, R. 2002. Mantodea: Gottesanbeterinnen der Welt. Natur und Tier Verlag, Münster. Gorochov, A.V. 2013. No evidence for Paleozoic origin of mantises (Dictyoptera: Mantina). Zoosystematica Rossica 22(1): 6–14. Full article (PDF) Reference page. Grimaldi, D., 2003. A revision of Cretaceous mantises and their relationships, including new taxa (Insecta: Dictyoptera: Mantodea). American Museum Novitates 3412: 1–47. Mohammad, S.K., Alla, S.M.G., El-Hamouly, H., Ehrmann, R. & Nasser, M.G.E-D. 2011. Mantodea of Egypt. Zootaxa 3044: 1–27. Preview (PDF). Mukherjee, T.K., Ghosh, A.K. & Hazra, A.K. 1995. The mantid fauna of India (Insecta: Mantodea). Oriental Insects 29(1): 185–358. doi: 10.1080/00305316.1995.10433744 Reference page. Rivera, J. & Svenson, G.J. 2014. 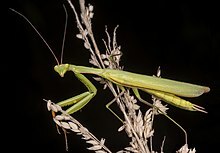 A revived focus on the praying mantises (Insecta, Mantodea). Zootaxa 3797(1): 1–273. Reference page. Rivera, J. & Vergara-Cobián, C. 2017. A checklist of the praying mantises of Peru: new records, one new genus (Piscomantis gen. n.) and biogeographic remarks (Insecta, Mantodea). Zootaxa 4337(3): 361–389. doi: 10.11646/zootaxa.4337.3.3. Reference page. Svenson, G.J. 2014. The type material of Mantodea (praying mantises) deposited in the National Museum of Natural History, Smithsonian Institution, USA. ZooKeys 433: 31–75. doi: 10.3897/zookeys.433.7054 Reference page. Svenson, G.J. & Whiting, M.F. 2004. Phylogeny of Mantodea based on molecular data: evolution of a charismatic predator. Systematic Entomology 29(3): 342–352. Tedrow, R., Nathan, K., Richard, N. & Svenson, G.J. 2015. A survey of the praying mantises of Rwanda, including new records (Insecta, Mantodea). Zootaxa 4027(1): 67–100. doi: 10.11646/zootaxa.4027.1.3 Preview (PDF). Reference page. Brannoch, S.K., Wieland, F., Rivera, J., Klass, K-D., Béthoux, O. & Svenson, G.J. 2017. Manual of praying mantis morphology, nomenclature, and practices (Insecta, Mantodea). ZooKeys 696: 1—100. doi: 10.3897/zookeys.696.12542. Reference page. Moulin, N., Decaëns, T. & Annoyer, P. 2017. Diversity of mantids (Dictyoptera: Mantodea) of Sangha-Mbaere Region, Central African Republic, with some ecological data and DNA barcoding. Journal of Orthoptera Research 26(2): 117–141. doi: 10.3897/jor.26.19863 Reference page. Tree of Life Web Project. 2003. Mantodea. Praying mantids and their relatives. Version 01 January 2003. For more multimedia, look at Mantodea on Wikimedia Commons. This page was last edited on 20 March 2019, at 00:31.